It seems that with my reviews of this week's "New 52" issues, I've been releasing them in alphabetical order, so why stop now. 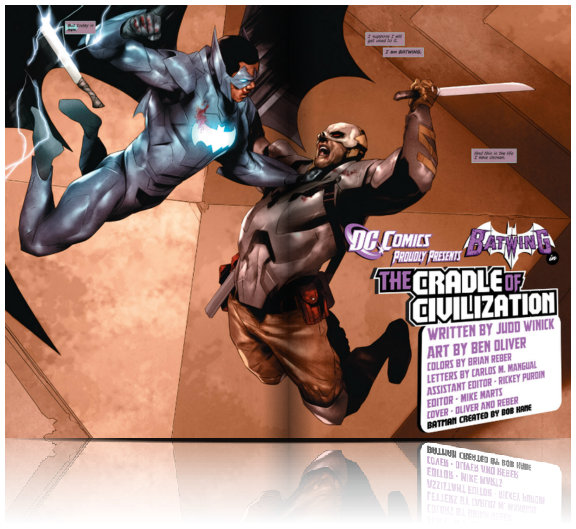 I will be the first to admit that when I heard that “Batwing” was getting his own title in the DC New 52, I snickered. When the character was introduced in “Batman Incorporated”, a comic devoted to Bruce Wayne finding heroes around the globe to join his war on crime, I couldn’t help but think of another term designated to “Batwing”. Come on, any dude in his mid twenties to thirties will agree. To refrain from being vulgar I’ll include a link to the definition HERE. 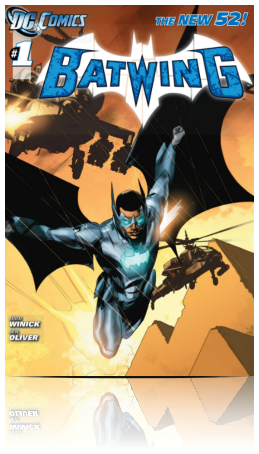 Setting that aside, I really enjoyed Batwing #1. This is the story of David Zavimbe, an officer in the Tinasha Police Dept. in Africa. He has been chosen by Bruce Wayne to deliver much need justice to Tinasha. Equipped with an armored suit, more Iron Man than Batman. Judd Winick is one of my favorite writers in comics today, and he delivers a strong first issue. We get inside David’s head and learn much about what he stands for. He’s a smart cop who is weeding out the corrupt members of his police force, constantly questioning them even though he knows the answers to make sure they aren’t withholding clues or evidence. You can also see why Batman has chosen David to dawn the mantel of Batwing and have the honor of wearing a Batman-esque logo on his chest. Ben Oliver’s art is wonderful and matches the tone of the book perfectly. His backgrounds are sparse but he makes up for them in his fantastic characters. Their facial expressions are great. Africa is much different than Gotham and it is interesting to see a Batman-like character finding a way to bring justice to it. I would definitely recommend this first issue to any Batman fan or any Marvel Zombie who is into Iron Man or Black Panther who is looking for a DC book to try.